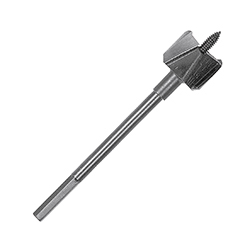 WoodEater® wood boring bits are designed for fast, repetitive boring in wood with portable drills. The bits cut three times faster and last seven times longer than standard spade bits. The self-feed screw helps draw the bit through the wood. Ideal for overhead work, rewiring and remodeling.